Hi everyone! It is Nora here and I will show you the Moon Notebook Cover, that I altered for this month..
Hello again, Stephanie here! I’m so excited that it’s finally getting cooler here in the south. With cool weather and falling leaves comes my favorite time of year... HALLOWEEN! My project for the “In the Night” is a creepy, fun wall hanging that depicts a Halloween nighttime scene. Look at all those yummy embossed bits! With this piece I decided to cover it entirely with Emerald Creek Embossing Powders. Full list and links at the bottom. I base coated the piece with acrylic paints including a few Paper Artsy acrylics. The Raven definitely needed Salted Raven Enamel Embossing Powder. On the cross I chose to use Dirty Sand Baked Texture and the tombstone looks eerily awesome in Gunmetal (honestly one of my absolute favorites!) I chose to add some Just Java Aroma to the cross later. The bats at the top are covered with Onyx Frost and the bats on the right are adorned with Slicked Smoke. Mardi Gras on the pumpkin stems. I decided the bats needed a lil more color so I layered Dragons Egg on the top bats and Midnight Magic on the right. 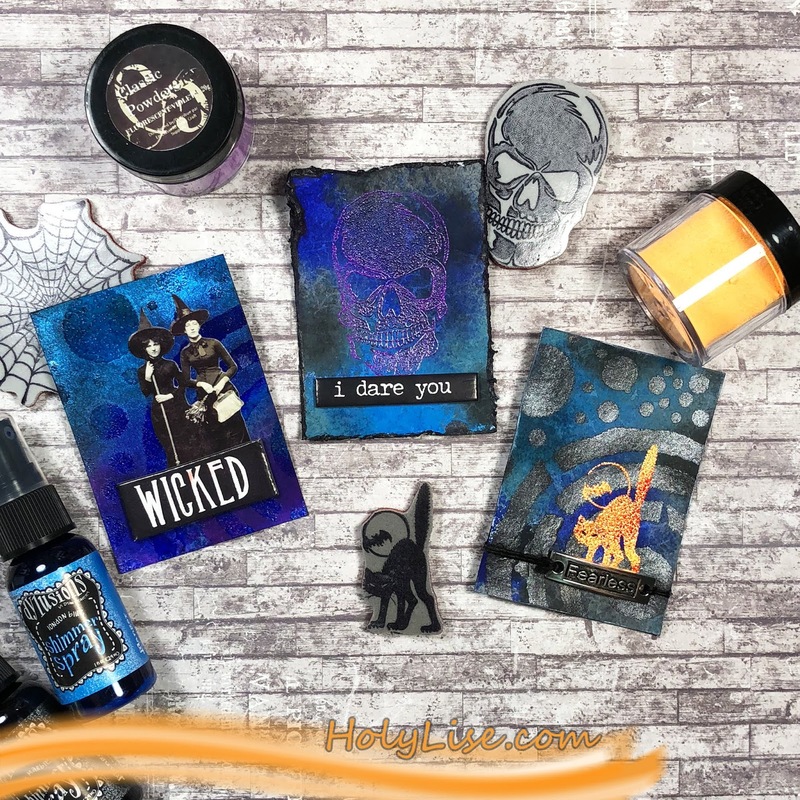 I really love how well the embossing powders worked together! Also added a base coat of black paint to the rim. Next I used the embossing stamp pad over a stencil and embossed with Gunmetal. Chic Camo embossing powder covers the creepy tree. I felt the piece still needed a little something and added a ghost and scaredy cat wood cut out. The ghost is covered in Silver Sparkle and the scaredy cat is Slicked Smoke and Vintage Beeswax. Purple lights around the sparkly ghost. To finish the wall decor I added some tulle poufs to the top and Cut out a circle of scrapbook paper I have in my stash that has creepy monster eyes. Below are a few images before and after the paper backing was added. I hope you enjoyed my project this week! This can be done with any wooden decor no matter the theme! I had so much fun working on this! 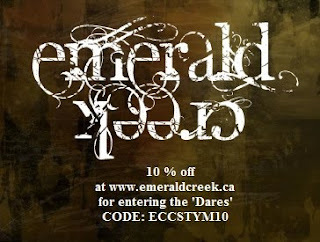 and we are featuring the magical mysteries line from Rita Barakat and Emerald Creek! We are hoping to introduce you to many ways of using these new and mysterious embossing powders, turning your works into magical art. A special thank you goes out to all of the talent in this line up. Joe, Midge & Madge, Fredrique, Cathy, Stephanie and our amazing coordinator Katelyn, we couldn’t have done this without you. To enter the contest just comment on every project in the Hop by clicking through the links at the bottom of the page. The contest closes October 10 at 11:59pm One lucky winner will be announced Friday October 12. Use gloves and adhesives are paints to soften, mold and adhere the fibre. pull it, roll it, and shape it how you want. Then I sprinkled the Magical Mysteries embossing powder - Midnight Magic - over the drying glue areas. (I used crackle accents because that's what I could find in that moment. 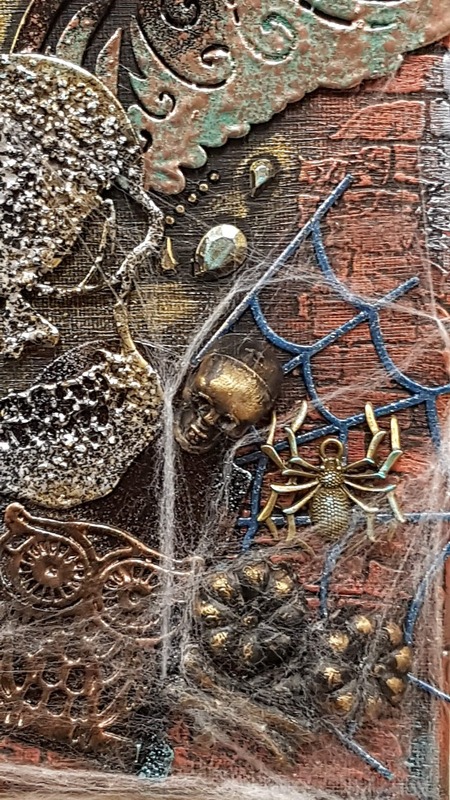 The Spider web is baked with Gun Metal Embossing Powder. And 2 tones of spray stain, iced spruce and fired brick, with dabs of Stazon refill covered the spiders. Then we laid down layers of the Fairy Wing Kit - Beginning with the base, the sprinkling in the colours over the hot base. this allows it to stick and melt on contact. The Moon and Flies were covered with the Fairy Kiss. It is a translucent powder so it blends with the colour of background, but in the dark, it has a beautiful aqua glow. We now have a fairy woods inspired wall board! Hello, Karla back today! I hope all my Canadian friends are having a wonderful Thanksgiving this long weekend! 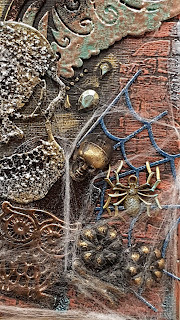 At my house we are decorated for both fall and Halloween, which is only a few weeks away... Our challenge here this month is 'In The Night', so this was a perfect time to create a spooky and fun Halloween tag with lots of techniques and details. Be sure to scroll down so you can check out the video I'm sharing of the process I used. I decided to combine the All The Love Songs Gentleman with the Hollo Doubt Skull Stamp to create this well dressed and a bit creepy fellow! Embossing the skull with Hammered Metal gives a shiny, cool effect. 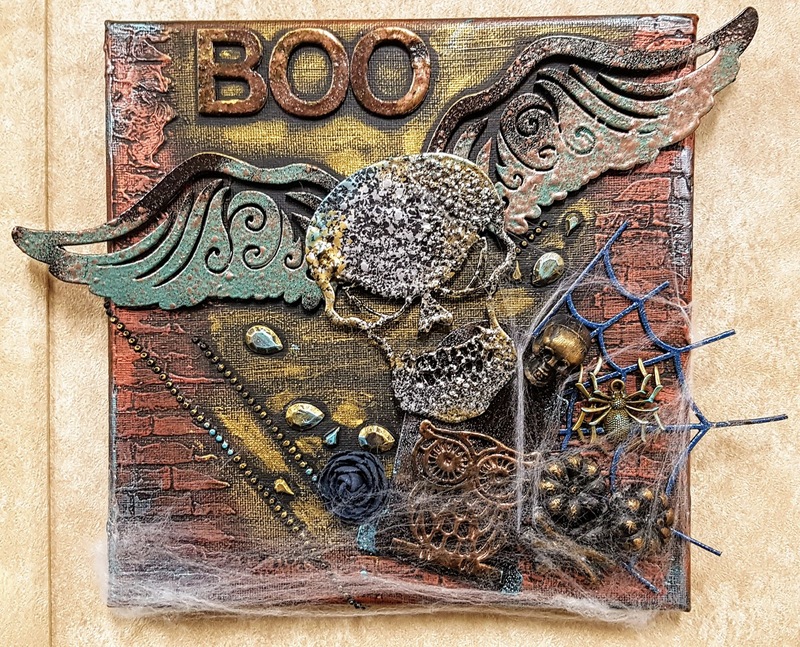 I absolutely love how the Paper Artsy Paints by Seth Apter covered the Southern Ridge Chipboard piece - and then adding the Fractured Ice embossing powder made it look even more amazing! 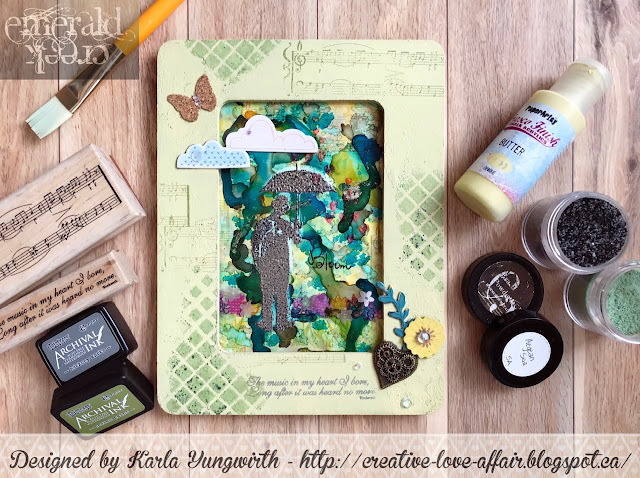 The background on a Tim Holtz Etcetera Tag uses lots of fun paint, mists, Distress Resist Spray and embossing powder - you'll definitely want to check out the video to see how that came together! I hope you have a fabulous week ahead, and can't wait to see what you come up with for the 'In The Night' challenge! !